It's been a while since I have written and it hasn't been for a lack of viewing good documentaries nor new ones at that. The delay in writing may probably more be associated with the amount of time that has passed since I have seen a documentary that stands out to me enough to write about. But today I have in fact found one. 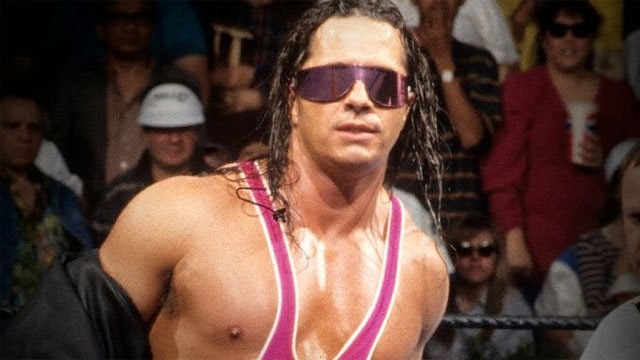 Hitman Hart: Wrestling with Shadows was made in 1995 during a big boom in the sport of pro-wrestling. It was and age where Stone Cold Steve Austin and The Rock were born. And an era where the reality of the sport was no more in question as the enjoyment of it. 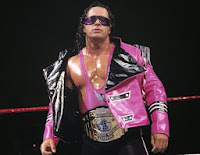 During this period Bret Hart's was also on the front pages of wrestling, but not for his fame, fortune, or well earned respect. Instead he was on it for a Vince McMahon deal gone bad, and he left with a documentary that uncover it all. An ideal hero, Bret Hart buys into the idea of doing the right thing. Both in his personal life and as a WWE character. Vince McMahon on the other hand is a villain and the line between his personal life and character is in question. The two's path cross dating back to the origin of the WWE and collide on the verge of it's collapse. Bret not being able to separate his real life character to the fictional one. Looses focus on the difference and falls pry to the evils of wrestling entertainment. McMahon however doesn't seem to know any difference. And fails to give honor a departing hero in his last days. Showing a unique glimpse into the reality of this sport. The film solidifies these two characters both in the world or pro-wrestling and in life. And in the end touch on just how real these human like characters of wrestling really are.